The most recent article in the Loudoun Times published on September 2, 2015 addresses the concerns of Sterling community members as well as ex-Calvary Temple members relating to Officer Kevin Robinette’s possible conflict of interest as a member of Calvary. The above sports camps are currently being promoted by Calvary Temple to the communities of Sterling, Sterling Park, and surrounding areas. 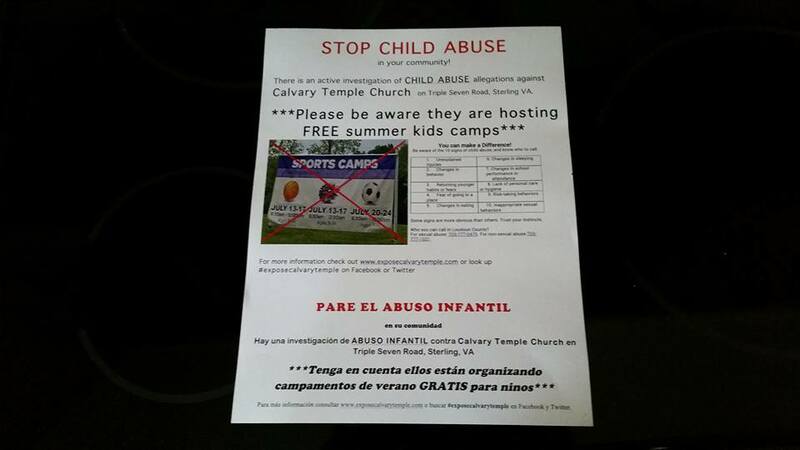 Please warn your friends and neighbors about these free camps. By the way, please don’t honk while a protest is going on…it is being reported to the Sheriff’s Office. (most likely by Calvary Temple). They have been pulling over “honkers” and giving a warning. But please know that the waves and thumbs up are greatly appreciated! Calvary Temple and #ExposeCalvaryTemple has been covered by numerous media outlets. Please follow the links below to read/watch.